I’ve blogged before about how important I think Specific Carbohydrate Diet Yogurt (AKA 24-hour yogurt) can be for healing. You can read about exactly why I think everyone should at least try 24-Hour yogurt here. But, the truth is when I got started with SCD and 24-hour yogurt the whole idea was overwhelming. Not only did I think store bought yogurt was perfectly fine (it’s not); I had never made any fermented foods (should be easy, right?). A couple of burnt pots of milk, a batch of lumpy yogurt and I was up and running. As time went on, I picked up some time-saving pieces of the puzzle from readers of the blog and other places. Now, before I go any further just a word of caution, Jordan and I do not recommend trying dairy until you’ve been on the SCD diet at least 30 days (it’s one of the 4 horseman!). When we started SCD Lifestyle, there was no one best way to make gut-healing 24-hour yogurt. Commercial yogurt makers are too hot to make proper 24-hour yogurt (the ideal temperature is 100-110° F). Not kidding, when Jordan and I started following SCD years ago, we used a regular yogurt maker with a dimmer switch to keep the temperature cooler! I hope that tells you how important real 24-hour yogurt is – we were willing to “Frankenstein” a yogurt maker to get it! Other methods include a slow cooker (again, often too hot or too cold), or incubating the yogurt with a heating pad (very finicky). Essentially, no matter what method you chose, making the yogurt required 24 hours of babysitting, and more often than not the yogurt didn’t turn out right because of fluctuations in temperature. Luckily for all of us, a lot has changed in the last 8 years. “Gut health” has gone from fringe topic to a mainstream health concern. That means products that make living a healthy gut lifestyle are WAY more readily available. That’s where the new Luvele SCD- and GAPS-approved 24-hour yogurt maker comes in. This is the very first yogurt maker specially designed for making healthy gut 24-hour yogurt. We’re making the Luvele yogurt maker our “official recommendation” for healthy gut 24-hour yogurt. 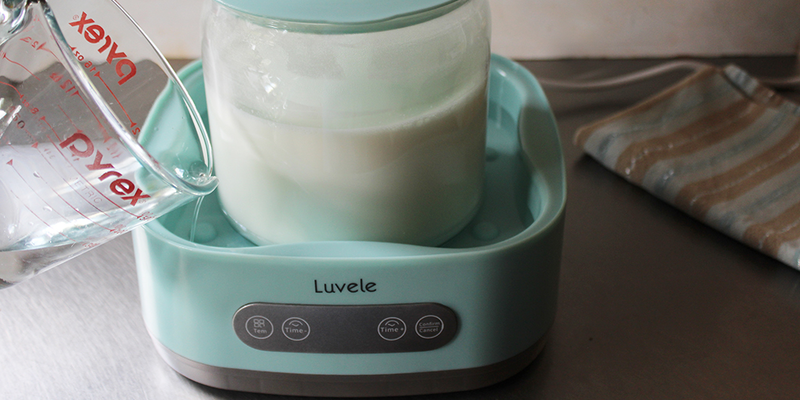 And today we’re going to walk you through exactly how to make healthy gut yogurt at home, using the Luvele. Before we dig in to how to make the yogurt, I want to explain why we are using goat’s milk and how to choose the right milk for you. You can use regular dairy milk, goat’s milk, camel, sheep’s milk, almond milk, coconut milk, or other alternative milks, too. For best results, use the highest quality milk you can get – raw, unpasteurized, organic milk is best. If you can’t access raw milk, pasteurized will still work. 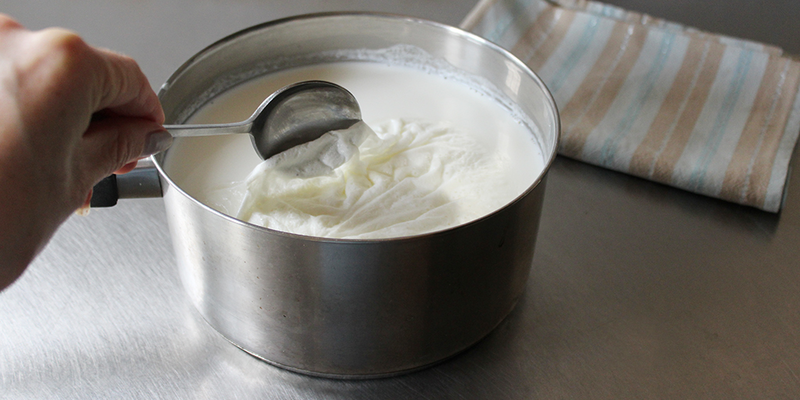 If you’re using raw milk, you don’t need to heat it first before adding the yogurt starter. If you’re using pasteurized milk, make sure you do heat it before making yogurt (more on this in the directions below). If you’re using almond, coconut, or another alternative milk, make sure to check the ingredients for artificial flavors, sweeteners, etc. I like to use homemade almond milk or canned, additive-free coconut milk. If you’re using an alternative milk like almond or coconut, you will have to add a little sugar to the milk along with the yogurt starter. Don’t worry – the sugar isn’t for you to eat, it’s for the bacteria in your yogurt! By the end of the fermentation process the sugar will be gone. We cover that and how to adjust the fermentation time for nut milk in our eBook. In the directions below, I’m using goat’s milk. We think starting with goat’s milk (or another non-dairy milk) is ideal. If you tolerate the goat’s milk yogurt, you can always “advance” to cow’s milk on your next batch. And if you’re lactose intolerant or “allergic” to milk, it’s really important to read this next part. First, remember that an allergy and an intolerance are NOT the same thing. If you’ve been diagnosed with an allergy to cow’s milk, please don’t eat yogurt made with cow’s milk without first talking to your doctor. However, if you’re lactose intolerant, you may find you can tolerate cow’s milk yogurt when other dairy products give you trouble. Why? Because during the unique 24-hour ferment process, the beneficial bacteria eat the lactose sugar. By the end of the 24-hour ferment, virtually no lactose remains in the milk (if fermented properly, like we’re about to show you how to do!). Choosing the yogurt starter you use may be even MORE important than the milk you use. You have a few different options. The easiest method is to purchase a freeze-dried yogurt starter. We recommend this one that is easy to find, or this one if you are strictly dairy-free. You can also use yogurt as a starter to turn milk into new yogurt. To do this, you’ll add ½ cup of prepared yogurt to your fresh milk before fermenting. Over time, using the same yogurt will lead to less probiotics in your finished yogurt. For that reason, we prefer using a freeze-dried starter every time. For most yogurt starters, we use 1/8 teaspoon per quart of milk. Always check the directions on your starter, as well. And know that more isn’t better. If you use too much starter, there won’t be enough “food” for all the bacteria and your yogurt won’t turn out. If you use too much starter, your yogurt will be runny or slimy. If you don’t use enough, your yogurt will be more like milk than yogurt (not very tangy!) Generally, this yogurt is safe to eat, it just isn’t as beneficial. If you want thicker yogurt, the first option is to drip it. Dripping is what turns plain yogurt into “Greek yogurt.” It’s the process of removing the whey, which is liquid. Dripped yogurt is also higher in protein per serving than regular yogurt. 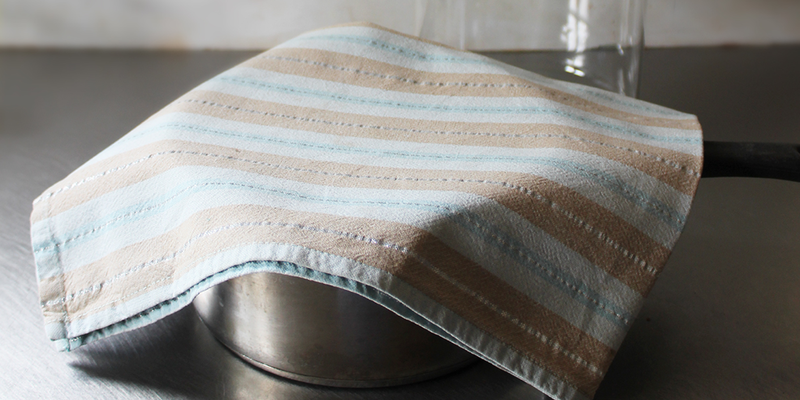 Dripping yogurt is really easy to do – just strain the yogurt through a cheesecloth. The excess whey (liquid) will drain away, leaving you with a thicker yogurt. Another option is to add a thickener like gelatin to the milk before fermenting it. Since gelatin is beneficial for gut health, adding gelatin to 24-hour yogurt is a win-win. 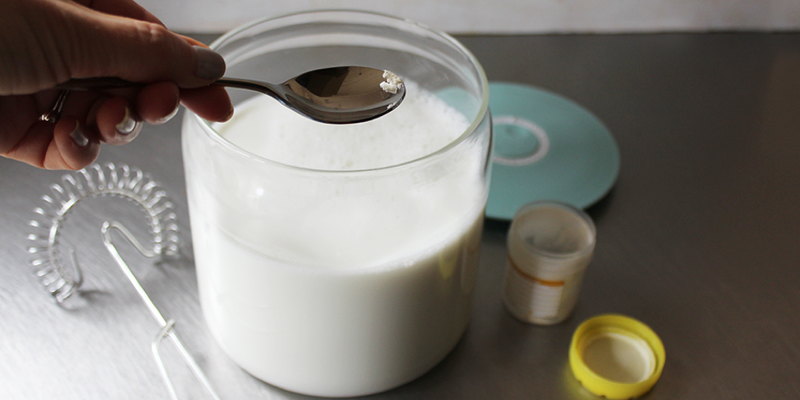 To thicken your milk with gelatin, add 1 tablespoon of gelatin per 4 cups of milk before heating the milk. The 24-hour yogurt experience is one of trial and error. Most of us have never made yogurt at home before and when a yogurt batch doesn’t turn out right, it can be really frustrating. Don’t give up. If you’re struggling with making the yogurt, we highly recommend trying one of these yogurt makers. They have made yogurt-making almost effortless. And if you react negatively to the yogurt? Introduce it VERY slowly – as little as ½ a teaspoon per day, slowly increasing. Don’t eat too much – 1 cup per day is the most we recommend. Can’t tell if you’re reacting to the milk or the starter? Try freezing a small amount of the yogurt and then consuming it. Freezing will kill off the beneficial bacteria. If you still react to the frozen yogurt, you’re probably not tolerating the milk you used. Enjoy and remember at around 700 billion CFUs of probiotics per cup this stuff can work wonders! (Note: If you’re using raw, unpasteurized milk, you can skip heating the milk and to Step 4). 2 – Over LOW heat, slowly heat goat’s milk to 180°F. It’s really important that you don’t let the milk boil or burn. Be patient at this step and don’t crank the heat too high. 3 – Turn the heat off, cover the milk, and let it cool back down to around 100°F. 4 – A “skin” will have formed over the top of the milk as it cooled. Use a spoon to remove this skin and discard. 5 – Pour the milk into your yogurt maker. Then add in your yogurt starter and whisk gently to combine. It’s now time to start fermenting! 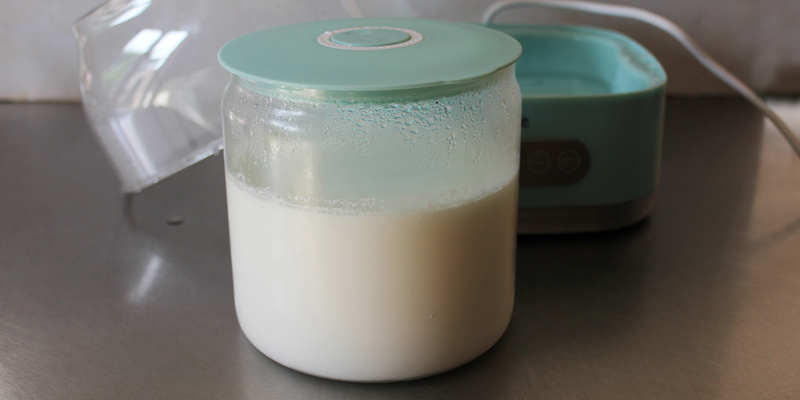 6 – Place the lid on the yogurt and put inside the yogurt maker. Add water to the fill line. 7 – Put the cover on your yogurt maker and set the temperature to 100°F and the time to 24 hours. 8 – When 24 hours have passed, your yogurt is done fermenting. It will be warm and runny, though – and isn’t quite ready to eat. The probiotics still need to set. Carefully remove the yogurt container from the maker and place in the fridge. Don’t stir, mix, or shake. Let cool for at least six hours. 9 – After the yogurt has cooled for 6 hours, it’s ready to eat! It will keep for 1-2 weeks in the refrigerator. You can drip or thicken the yogurt if you prefer (see above). I hope this recipe helps you get started making your own 24-hour yogurt. 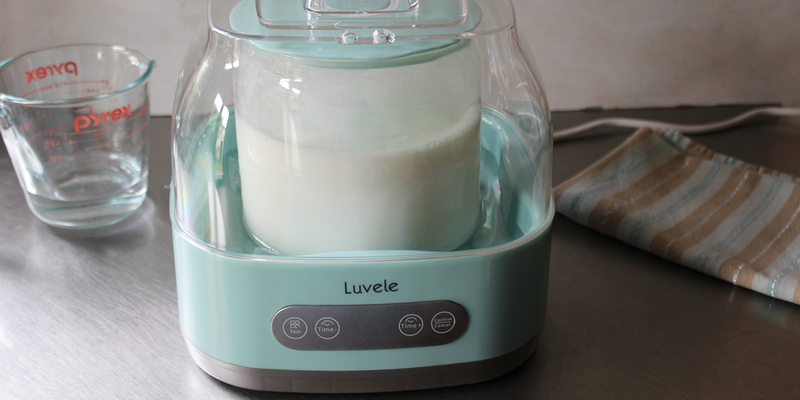 And if you’re on the fence about trying it, we highly recommend getting a yogurt maker from Luvele. This is the only yogurt maker specifically designed to make powerful 24-hour yogurt, and it truly makes the process easy. P.S. Leave a comment and tell us your favorite way to enjoy 24-hour yogurt. I have SIBO and I follow the ace diet. I make 24 hour yogurt with the Luvele machine that you suggested. Alaways comes out great. Question – first time using raw organic cow milk from reputable farm. Some websites say heat others like yours say not necessary. A bit nervous. Should I or shouldn’t I heat? Hell0 – According to the company – Raw milk has many important enzymes that are destroyed if heated and thus they recommend not to. Hi. I just made my first batch of raw goats milk yogurt. The starter I used is a unique one by Progurt (https://www.progurt.com/products/probiotic-5-pack). I have made the yogurt before with organic half & half. It came out very thick and creamy that time; however, this time when I opened the container after it had set in the fridge, there was complete separation of solid and liquid. It was about 1/4-1/3 thick, cheese-like curd on top and the rest was a cloudy liquid (which I assume is whey). Is this safe to eat? I was thinking I could run it through the blender to reconstitute it, but am concerned because it’s sooooooo different. Hi Mariah – I can’t say for sure because I’m not in front of the yogurt, but some separation is normal. Give it stir with a spoon – it it smooths out, it is OK to try and see how it tastes. If you can’t seem to stir it together, it might be a sign that something went wrong in there fermentation process. Do you have a recommended brand/type of gelatin for thickening the yogurt? I’m also using the Luvele 2-liter maker, goats milk and the yogourmet starter. Thanks!! Ok, I am already intimidated by making my own yogurt. I was going to make my first batch today, but upon reading the Luvelle manual it states that I should not use a starter with Bifidus/Bifidum bacteria for SCD yogurt. What gives? I was planning on using a Seeking Health ProBiota Sensitive probiotic capsule (which is SCD and GAPS compliant) as my starter. But, now I’m thinking I shouldn’t use the capsule since it contains bifidobacterium bifidum strain. Any advice? Should I just stick to the starter you recommended? HOWEVER – we don’t think everyone needs to follow all the strict rules in BTVC. Some of the original rules of SCD have been disproven or updated as new research comes about. Remember that you’re the expert on your body and the boss of what you do and don’t eat. In our opinion, if you’re tolerating the probiotic capsule, you should be fine to make yogurt out of it. I made my first batch of yogurt using a recipe from the Luvene Recipe Blog. It seemed easy because it didn’t require that I warm up the milk first. I used Coconut Cream. After 24 hours in the yogurt maker, I put the yogurt into the refrigerator. It grew green/blue mold on the top. Is it supposed to do that? Also, I ordered my starter from Amazon and didn’t realize it came with a cold pack. It was three of four days before i opened the box and put the starter in the fridge. How much sugar would i need to add? Do I need to heat coconut milk? For 4 cans of coconut milk, we use 1 teaspoon of sugar – so not very much! You don’t need to heat the coconut milk beforehand. I have used an 8 quart Instant Pot to make at least 10 batches of 24 hour yogurt. It is much easier than the light dimmer crock pot method. The yogurt setting allows you to bring the milk to near boiling, then after cooling to about 100 add the starter and set the time for 24 hours. It works great! Thank you Pat. I am Lactose Intolerant and your information regarding the Instant Pot is appreciated. I will definitely be purchasing this yogurt maker, although I have been using the Yogourmet maker for two years now with the dimmer switch successfully – I think… Anyway, we use cow’s milk with one variation – half milk, half half&half. This results in nice, thick, delicious yogurt. This was advice we got from a naturopath, so we hope this hasn’t been hurting anything. My method, which apparently needs to be adjusted, is to use two packets of the starter to mix with the milk.half&half to fill a 64 oz. jar. First I bring the milk to a low boil (fairly quickly) and let it low boil about a minute, then I place that pot in a bigger pot full of ice water for about 10 minutes, which brings the milk down to a lukewarm temp. Then I mix the starter, put it in the jar and THEN place it in the overn at 190 degrees for 25 minutes until the mixture gets back up to about 100 degrees. Then it goes in the yogurt maker for 24 hours. This seems to work and I end up with nice smooth yogurt – but have I been doing major damage using this method? I am new to the scd game. Going to start it up for my newly diagnosed 14 yr old. She seems to be lactose intolerant, although she hasn’t been tested. I will begin with goat’s milk. These posts are dated a touch and I am wondering if you have tried yogurt in the instant pot? I want a lactose free scd instant pot yogurt, you know, if that is possible…I am still learning. Thanks! Well, Gina, I don’t know how you are doing by now. It’s March 2018. However, I have investigated the Instapot seriously, and continue to do so. I don’t want another appliance in my tiny kitchen, and don’t want a Luvele if it makes runny yogurt. I suggest that anyone using an Instapot for yogurt call their customer service line and make sure (really sure) to clarify that you want 24 hour lactose free yogurt. Then if possible, compare with the rules set out by Elaine Gottschall in the Breaking the Vicious Cycle book (or online). You will be enlightened that their temperatures for making yogurt don’t quite match. What I am making out of it is that I have to heat the milk as usual on top of the stove to a 185-190 (cows milk) simmer. Then cool. I use an ice bath in the sink for a half gallon of yogurt. When cool, I mix in 1/2 cup of quality ready made yogurt from a local creamery, then heat to 100-110 again on top of the stove. Then, I can place in the Instapot and set on “yogurt” and manually set the time. The machine senses the temperature and then kicks in fairly quickly and should keep the yogurt mainly within the 100-110 guideline. At about 96 or 97 degrees, it heats up to the proper temp automatically. At least the thing babysits for 24 hours. Also, I don’t know why people have such trouble making thick yogurt. I have made a hundred mistakes learning this process, and never had runny yogurt with Organic Valley cows milk NOT ultra pasteurized, NOT homogenized, or the Whole Foods comparable brand and our local Trader’s Point Creamery plain yogurt for a starter. I usually use whole milk, as the lesser fat milks burn the bottom of the pan easily. So far this isn’t all that much fun, and I substitute when I can with Green Valley Organics lactose free yogurt. I seem to tolerate it. But the homemade, flavored the way I like it tastes SO good! Good Luck. Hello, and thanks for the tremendous help and resource you all are to so many! I have your ebook and found, just as you say…if we stick to exactly in the beginning, things have a much better chance of going well. My question is on kefir. There are lots of good videos and info available on making it. Do you have any pointers or cautions other than be sure you can tolerate dairy first? Our biggest tip for yogurt or kefir is to wait until you’re feeling good on the diet – usually around day 30 – and then introduce it very slowly! A good place to start is with one spoonful per day. 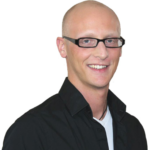 Hi Amanda – thanks for reaching out! We’re so glad to hear you’re digging the book and meal plans and feeling better. A small amount of manuka honey mixed into the yogurt right before eating shouldn’t be enough to kill off the probiotics – but if you’re wanting to use Manuka Honey for it’s anti-bacterial properties, you might be better off eating it separate from yogurt and mixing regular honey into your yogurt for flavor. HELP!!! I’ve been fermenting a batch of yogurt since yesterday The yogurt maker was still on when I went to bed last night (13.5 hours at that point, but when I woke up later, it had been turned off. I have no clue how long it was off but the temperature of the yogurt reads 80 degrees. Is it possible to plug the yogurt maker in again and continue to ferment for another few hours??? Or is the batch ruined. This, of course, was my Thanksgiving meal. 🙁 ANY HELP GREATLY APPRECIATED!!!! Hi Bobcat17 – this is SO hard to answer. Obviously, you’re the only one who can see/smell the yogurt. If the yogurt’s fermentation wasn’t completed, some of the lactose sugar may remain, which can cause a reaction. If they yogurt wasn’t kept at the proper temperature, it could have grown pathogens that can cause a really unpleasant bout of illness. Our gut instinct is to tell you you’re better safe than sorry, and to not eat the yogurt. I’m so so so sorry! All is not lost though – there so SO MANY SCD-legal Thanksgiving foods. If your family’s turkey recipe isn’t SCD legal, you can cook a separate turkey breast for yourself with only approved oils and spices. You can mash butternut squash, have steamed green beans, and apple or pear sauce. Hope this helps and you enjoy Thanksgiving with your family. I’ve been making scd goat’s milk yogurt for years now, but this time I forgot to add the starter. Searched the Internet to see if it would be safe to start over with it, but couldn’t find a definitive answer. So I decided to reheat it in case any bad bacteria had started to grow in there. (I hadn’t heard about sterilizing equipment until this morning.) Is that the right thing to do? Unfortunately I stepped away from the kitchen and the milk boiled over. Now it’s very watery with curds on top. So is this just a bust? Should I throw it out or can I use it for anything? Hi Jeanette – we aren’t experts on food safety, but we don’t recommend using this milk for anything. We suggest you start over with fresh milk! I didn’t have time to dig through all the SCD yogurt articles so sorry if this has been answered before. Do you have to heat the milk (goat or cow) or is heating the milk an optional process? I’ve read where some people do not heat their milk and the yogurt turns out just fine. I know about possible pathogens taking over your batch of yogurt, but some claim raw milk or milk that is not heated is the best for overall health. Thoughts, ideas, comments? ps, SCD is slowly turning my 6 years of extreme Ulcerative Colitis nightmares into a future of normalcy. Not out of the woods yet but GETTING THERE! Woooo! Hi Eric – it’s so awesome to her you’re doing well on SCD! We recommend intruding yogurt slowly around your fourth week on the diet (definitely not before your symptoms have begun to improve) and following the directions in this article – including heating the milk. You can use raw milk to make the yogurt if you want, but we still recommend heating it to 180 degrees when you make the yogurt 🙂 Steve and Jordan do recommend raw milk if it’s available in your area. Thanks so much for the quick reply! I’ll keep you guys posted on my progress through the SCD journey. This website has great information that has helped me out. 2. Add in one packet of Knox Gelatine (from the 4 packet box, should be 1 ounce each). I do this as the milk is being heated. By the time you reach approx. 180 degrees it has completely dissolved. Make sure you use Knox Original Unflavored Gelatine, there’s no bad stuff added and it’s SCD Legal. 3. Stir stir and more stir. I use a medium size nonstick pot and an oversized, silicone, heat proof, spoon type spatula. I stir throughout the entire heating and cooling process. I’ve never had top skin, burnt bottoms or any nasty stuff. 4. Cool with water. I have a double sink. When I’m done heating, I’ll move the pot to the first sink and run the water until the pot almost floats (don’t forget to plug the drain). At this point you can feel that the cold tap water has warmed up quite a bit. Transfer your pot to the second sink and do the same. If you really want to speed the process, drain the first sink and transfer back to that for a 3rd cooling session. You’re down to 100 degrees in less than 8 minutes. Remember, you’re stirring this entire time. 5. Tabletop lamp dimmer switch. I use one because of the Yogourmet maker. Once this past Summer when the house was warmer, I checked the water temp, it was almost 125 degrees. I just tweaked the switch until I was always in the green zone. I adjust as needed depending on how warm the house is at the time. The Yogourmet doesn’t have a built in thermostat, so this helps regulate the temps. Some say not needed and overkill. I’ll call it a personal option choice, if it makes you feel better about the quality of your yogurt, go for it. 6. Blot the water. You’re saying what? Blot what water? After your yogurt has fermented for 24 hours and you’re about to put it in the fridge, pop the lid on your container. Sometimes there is condensation on the inside of the lid and on the top of your yogurt. Shake the water off the lid, then using clean napkins or paper towels, blot the excess condensation off the top of your yogurt. The first few batches I made I didn’t do this and there was a funky skin or film on top after the cooling period. After I blotted the water this problem went away and my yogurt was absolutely perfect every time. Enjoy! 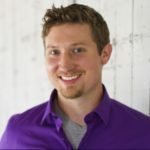 Thanks for sharing these tips Eric 🙂 Awesome information. Yogurt sounds good right about now! My question for you guys is why you haven’t replied to the three questions about microwaving the milk. I’ve read a couple blogs before about the detriments of microwaves when it comes to the nutritional value of food, so I’m shocked to see you guys being a proponent of it. Would love to hear your thoughts! Steve and Jordan recognize that beginning the SCD diet can be difficult enough for many people and they advocate doing what you can to make it a little easier – including microwaving if that helps. If you’re personally uncomfortable with microwaving, you can use the stove to heat the milk. i’m korean, scd diet one year. nowdays, milk is reported to be banefulness. ex. milk’s hormone, protein, etc.. I think so too. milk allergy cause many disease. but, Dose homemade yogurt exclude milk’s pernicious ingredients?? i’m sorry. english ability ?? Hi Rosaline, milk products vary in quality and therefore vary in how they affect us. Due to the process of fermentation that yogurt undergoes, it restores many healthful properties and makes it easier to digest. The highest quality is raw milk from grass fed cows and you can also try goat’s milk as well. My question is, can I use buffalo milk to make SCD yogurt (this is the only milk I can eat) ? 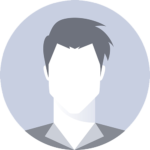 Hi Ulysse, thanks for reaching out! You can certainly give this a try and you can also let your gut heal a bit more before testing out the goat milk again. I was given some kefir grains by a friend. She said I can make it out of regular milk. I am using organic full fat whole milk. Is this bad? It doesn’t taste like regular yogurt, more like a sour kefir. I thought it was healthy though… Am I wrong?? I pour the grains into a glass jar, fill with milk and let it sit on the counter for 24 hrs. strain the grains and start another batch..
Hi Alisa, thank you for reaching out! Kefir can be a great source of healthy bacteria for those that can tolerate it. We recommend letting your gut heal a bit before introducing this product. If you feel you are in a good place to introduce it, go ahead and do so and monitor any reactions. Whole cows milk is not a “bad” food, it is more so that some can not tolerate it. I made yogurt for the first time and it is super runny. I didn’t go over 24 hours, so I am not sure what I did wrong. I didn’t use GI Prostart, so could that be the reason? Also, do I have to toss out the batch? It is runny, almost like a kefir, but I would assume it is edible. Thoughts? Hi Keely, thank you for reaching out! Go ahead and consume a small amount to see how it tastes and to see how you react. It is hard to say the exact reason, but it could be due to inadequate temperature while fermenting or the starter you used. Thank you for responding. It tasted tart- but not like it was bad. I know my temperature was always around 100 when I checked. Could it not have gotten hot enough? I was afraid of it getting too hot. I am getting the GI Protect starter and will try again. Just wanted to see if I didn’t have to waste the money on a batch that didn’t turn out. You are kidding about the microwave, right? I read a study recently that showed how almost ALL nutrients and bacteria are altered and/or destroyed when using a microwave. Can’t seem to find the article though. I also have another question. I hate goat cheese and milk and am pretty sure goat yoghurt is not something I will enjoy (last time I ate goat cheese I actually threw up from the taste). I do have access to milk from pasture raised water buffalo. Would you recommend using this instead of cow’s milk? I want to pursue the question from Donna about using raw milk instead of pasteurized. Raw milk has the enzymes and is live. Why do you not use it in your recipe in the book? HI Mike, thank you for reaching out! Raw milk is illegal in some places and hard to access in others. We do suggest using raw milk if you have access and do not react to it. Hello, I was wanting to try using the raw organic whole cows milk. just wondering if I could still thicken it up with gelatin even though I’m not heating the milk first and if so, at what point do i add it to the milk? Hi Mary – I think the best thing to do would be to heat up a small amount of the raw milk to “bloom” the gelatin in – then mix the warmed milk and gelatin into the rest of your raw milk before fermenting. Thanks for this post, so much great info. I’m planning on making goat yogurt for the first time as soon as my yogurt maker arrives, but have a couple of questions. Can I use a store store bought yogurt as the starter for goat yogurt? Or does that just work with cows milk? Or possibly goat yogurt as a culture starter? Also, have you ever tried making nut milk yogurt with a store bought yogurt cultures starter or a freeze dried culture starter? If so, any advise on trying to make almond yogurt? Thanks! Any advise is much appreciate. Which is a good yoghurt starter when you have SIBO? What probiotics are good for SIBO and which are not good? I have a son with gut issues. Scd yogurt helps tremendously, but I could’t keep up with my 6 cup yogurt maker. I was on a mission to find a machine that would make yogurt by the gallons so I could have some too. I found it! The Brod & Taylor Folding Proofer http://brodandtaylor.com. I was very skeptical it is a folding machine and it was pricy, but I was so desperate I had to try it. I love love love it! It makes up to two gallons you use your own mason jars, it does not have a timer it runs however long you want it to run, and the best part you set the temperature! I make goat milk yogurt and it is runny when I just take it out of the yogurt maker but after a day in the fridge and straining in a Greek Yogurt maker http://www.culturesforhealth.com/greek-yogurt-maker.html for a few hrs. it is perfect. I really want to try making the goats milk yogurt since using half and half last time didn’t seem to work for me. But when I went to GI Pro to order, the shipping was $40, that is more than the starter?? I think maybe it is because I am on the East Coast. Is there another company out this way that you know of that has a similar product so that shipping isn’t actually more than the product? Please help me find a starter. Love your advice and that of all your readers. I don’t have an issue but both my spouse and 15yo son have Crohn’s. My spouse has learned well how to live with his, mainly through ignoring it and not being stressed which has the doctors amazed as it’s an unheard of method, but our son is new on this journey so I’ve been trying to learn all I can about proper nutrition for him so he can grow and have a great life. All of us are now on the SCD plan as it’s just easier keeping the kitchen SCD friendly. My first attempts at crock-pot yogurt and oven yogurt were disasters so I bought the Euro Cuisine Automatic Yogurt maker ( http://www.amazon.com/gp/product/B001KZM4Y4/ref=oh_details_o00_s00_i00?ie=UTF8&psc=1). I love it! We are now making a fresh batch almost every night as three of us are eating it. Tonight I’m going to trying your sauerkraut recipe and see how that goes. My son is still having some issues, but he feels they would possibly be worse had we not have switched to the SCD Plan. Here’s hoping this helps him to live a healthy life! Thanks again for providing this wealth of information! I have SIBO and have been on the SCD diet for ~3 months. I am planning to try to make homemade SCD yogurt for the first time. This weekend I bought the same Euro Cuisine yogurt maker model that you reference above – but the timer only goes up to 15 hours. Have you found that 15 hours with the Euro Cuisine is sufficient, or do you re-extend the timer for another 9 hours after the 15-hour timer ends (to ensure a total cook-time of 24 hours)? I read an article on the internet about a guy who had chrones disease and he did a small enema every night for a week and cured himself. He used butyric acid in the water. There is a brand by Bodybio and they sell pill bottle of the butyric acid for $30 for 100 pills. I think the guy used 8 pills every night. The good bacteria that line the colon feed on the butyric acid. It’s their main source of food and they love it. I have used it in enemas before and it did help with some constipation problems I have., just an FYI. ? I incubated it in the oven at the correct temp for 7 hours. Then i moved it to a warm place with towels wrapped round it. Is this ok? You say not to move it… but i dont have a Yogurt maker and I cant leave it in the oven for 24 hours because people want to use it. I dont know if I just wrapped it and left it one a warnish place for 24 hours… would be warm enough- since its not incubated at the correct temp? I used whole cows milk pasterised, and i got some gurgling in my stomach after eating it- do you think there was still Lactose in it? I am helping my husband starting the SCD. I just bought an electric yogurt maker from Lakeland and its instructions say to use 200ml of milk and 2tsp of any commercial yogurt and leave it for 8 hours. But as mentioned in the SCD, we must leave it 24hours. Please can anyone advise me what shall I do? The point of incubating for 24 hours is to ensure that all of the lactose is broken down. I start with lactose-free milk but if you start with regular milk, I would recommend running it for at least 16 unless you know that he isn’t severely lactose intolerant. 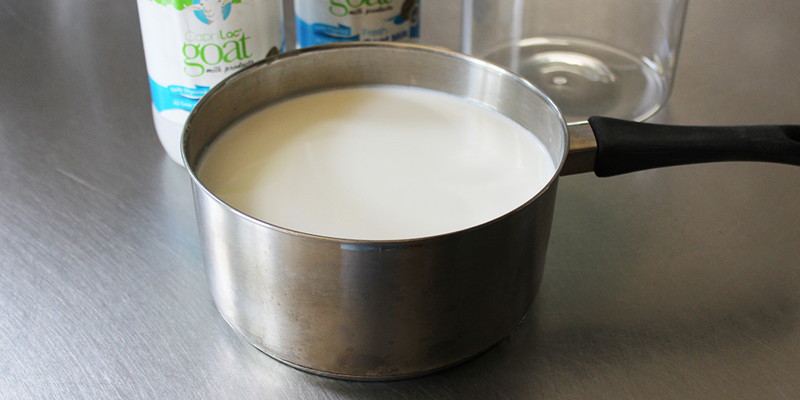 I heat lactose-free fat-free milk in a pot on the stove until the temperature is 110 or so. I pour it into a plastic container into which I have put 1 cup of nonfat dry milk and 2 drops of lactase enzyme (to ensure lactose-free yogurt). I put this into a small cooler and heat a big canning jar of water in the microwave, then cap it and put it in the cooler with the milk. When the temperature of the milk is down to 110, I add about 1/2 cup starter, usually Dannon plain yogurt, and mix. I leave a thermometer in the cooler and check it periodically, then reheat the water as needed to maintain a temperature of 90 or more. I just made my first batch of yogurt and realized i only used half the starter Will it have any live organisms? Also husband stirred it for a minute before it totally set.. is it even worth eating or should I start again?? @Blackbass – I’ve used both kinds, I believe the difference is the temperature at which the milk is heated. From a health standpoint less is better because heat can break down the protein structures. So raw goat’s milk would be best followed by pasteurized then ultra. i heated it to 180, let it cool to 100, added 1/8 teaspoon GI starter, let ferment for 24.5-25 hours at approx. 102 degrees….let it cool in refridge for 8-9 hours…and mush…very frustrating..any advice anyone? @ Blackbass – You should be fine to still consume it. Obviously start slow and make sure your body agrees with it. In general goat’s milk will be softer and more watery than cow’s so don’t compare the two. However you might see more success if you get your temp during fermentation up around 110 degrees. Thanks Stevo….I was curious about that..in the past I had been making my cows yoguart too hot…so I bought a dimmer to keep things around 100-105 degrees…but I can adjust it some to allow more heat. From your knowledge would the bacteria be harmed if it goes past 110? @ Blackbass – At some point yes they become harmed, but I’m not a complete fermentation expert… from what I read I wouldn’t worry about the temp until it gets above 115. My guess is its a gradual curve, so your noting going to trigger a complete loss of the bacteria, just lose some as the temp rises. Make sense? Maybe someone else reading this can chime in. Thanks Steven…hopefully the next batch will be the one we are looking for. I’ve been making raw cow’s milk yogurt (in mason jars) in my electric oven or years with no trouble. I prefer not to pasteurize raw milk, therefore I do not heat milk to the temperature stated in this blog. I’ll be experimenting with goats milk and report back. I make raw and pasteurized goat and cows milk and sour cream using yogurt culture. I once did an experiment and did them all at the same time. The pasteurized cows milk was the most like store bought yogurt the raw cow milk was a bit thinner, the pasteurized goat was a bit thinner still and the raw goat (my favorite reminds me of my childhood) was still rather fluid but definitely cultured. I use the last one to make smoothies. I used to make yogurt on a heat pad which worked with pasteurized cow’s milk but turned all raw milk into cheese which my (sister said the cheese was very good). Now I use my dehydrator and I have not had a failed batch yet. The cultured cream is very yummy! yogurt out of pasteurized goat milk – it doesn’t work. So apparently pasteurized goat milk won’t work – and indeed I just made a 2L watery batch. I think I will attempt to strain it, but not quite sure if it gets ride of the good bacteria, or just the galactose and lactic acid. @ Marta – Interesting quote from Elaine thanks for posting. I have to say I completely disagree based on doing it. The only goat’s milk I have access to is pasteurized and I was able to make it from several brands. I have no clue what biochemistry basis she would say that. The Goat’s milk SCD yogurt I made was always a bit watery on the top but it was totally yogurt and tasted pretty close to cow’s milk. Dripping the yogurt doesn’t get rid of much of bacteria don’t worry about that. What about Coconut Yoguart for those who have Casein Sensitivites like myself. Are there any receipes for making Coconut Yoguart? Saurkrut is high in FODMAPS and I react horribly to it. So no casien or no saukrut. Have you ever ran across someone like this? Hi Dawn – thanks for reaching out! Many people have problems with yogurt and sauerkraut early on because these are strong sources of probiotics. We don’t recommend you try introducing either until you’re at least 30 days into the diet and in your “feel good zone” with a solid group of foods you can eat and some symptom improvement. I have some questions – and some answers. I have tried various yogurt starter powders over the past few years, as well as every kind of commercially produced organic cow and goat yogurt I could find to use as starters. I have a favorite among the latter category. It has the same three active cultures as the GI Pro Starter – PLUS L. Acidophilus Bifidus. Will this be a problem for the SCD diet? My second question is regarding that 180 degrees. 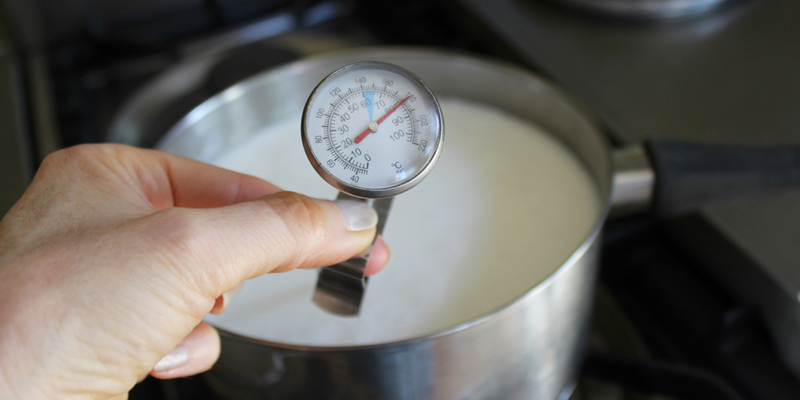 I know that yogurt recipes normally call for heating to 180 degrees, and having asked one cookbook author about it, learned that something happens to the character of the milk at that temperature that helps make yogurt thicker. That said, if pasteurization is the only concern, that could be accomplished by heating raw milk to 145 degrees for 30 minutes or 161 degrees for 15 seconds. Is there a reason that would not work? And what about raw milk, with all it’s healthful enzymes intact? Would that be good – or bad – for someone who needs the SCD diet? I am very fortunate to have an oven that you can set for 110 degrees, and have tested it by monitoring a thermometer in a glass of water to make sure the temperature range does not fluctuate very much. It normally stays at about 104 – 108 degrees. I like to make yogurt a gallon at a time and after the starter has been added, pour it into sterile jelly jars. I am particularly fond of Quattro Stagioni lids, since they are one piece, not two, and have a very nice coating. If the coating gets dinged, I throw the lid away and use a new one. The reason I can make a gallon at a time is that I have my own milk goat. That is how I know that it is true that goat’s milk generally does not set up nearly as firmly as cows milk. I have so far had a grand total of two milk goats, and the yogurt made from each of their milks was quite a different texture. The yogurt from the second goat that was made from milk soon after she “freshened” was a thick as cows milk, but later in the lactation, the yogurt became much thinner. In the spring, it thickened up a bit. I have since learned that the character of milk does definitely change over the period of lactation as well as seasonally, and that spring milk is by far the best for yogurt and cheese, as well as being much more nutritious than it is at other seasons. Regarding thickening the yogurt: not being on the SCD diet, I had tried adding nonfat dry milk powder and/or gelatin, which is recommended in my goatie “cook books” but was not happy with either of them, or the agar agar that I tried out for a batch. I finally decided to just enjoy my yogurt in it’s seasonally thin form, and not worry about the thickeners. Oh my! One and a half hours is too long to let the milk sit at room temperature. Many bad bacteria will enjoy growing in that time period. Additionally, it’s a bad idea to put that big bowl of hot milk in the refrigerator because it will really warm the whole fridge up (check it with a thermometer), and that’s very bad for all the rest of the food in there. I have been making yogurt twice a week for six years and here’s what I do. I heat the milk as you do, in the microwave, but I fill the sink with cold water and about six icecube trays’ worth of ice. Submerge the bowl in the water. It takes about 15 MINUTES to cool down to 110 degrees this way! If you make the yogurt with the GI ProStarter (I believe that starter is supposed to begin incubation at 75 or 80 degrees – I use that one too), it takes about 35 minutes to cool down to 75 degrees or so. Thanks for your tips from experience! @Samara: I use a crockpot and a dimmer switch plug. It took a few tries to get the exact setting on the dimmer switch (using just water until I got it right). I marked the dimmer switch with a permanent marker. I set a glass mason jar inside the crockpot, sitting on a potholder to even out the temperature. Filled it with one quart of 108 F water, checked every couple of hours until I got it to stay at 108. BTW, 100 is not 108 and it makes a difference! Now I just fill the same mason jar with the milk and culture at 108 F (after boiling, cooling, mixing in the culture), set it in the pre-warmed crockpot on top of a potholder, and simply leave it alone until the same time the next day. @xania – I’ve never used a crockpot to make yogurt and cannot speak to the possibilities. The post was written for use with the Yogurmet. Joe thinks it will be ok for pills to be frozen once, but not on and off, he would be concerned about condensation. The starter is ok to freeze, actually says so on the website. Hey folks, i’m busting to try some of this yoghurt making soon, though i have a small problem, I can’t seem to find a source of electric yoghurt makers in NZ, let alone dimmer switches that are portable ie. not already hard wired into a light. Any ideas greatly appreciated from anyone, maybe someone else not in the states where everything SCD is so readily available, another way of doing it, though still reliable. I have heard of a lamp in a polystyrene box, or oven light etc, all seem a bit hard and could be costly experimenting to get it SCD safe! I bought a yogurt maker with a 24hr timer from GAPS. I use goats milk – works well. Please see Australian website below. The yogurt was half frozen, the top half was pretty thick and icey like frozen yogurt but not rock solid. I emailed Joe and will update here to let people know. My mistake, goat milk is ok to 185. Maybe my last batch wasn’t pasteurized right anyway. @ Steven – Goat’s milk is much more delicate than cows, but you do still want to heat it up to 180. Not much past it as it burns very fast. I did make an edit to the post that you should cool the milk covered as to avoid any contaminates falling into it. As far as freezing SCD yogurt, from what I understand most if not all of the bacteria will die. It still is good to eat but just lacks that benefit. On the Pills and starter cultures, I’m not sure, I would send Joe over at GI Pro Health an email on it. Are you sure they got frozen solid? The pecanbread site says to use 1/8 tsp of the Prostarter PER quart. So for 2 quarts it would be 1/4 tsp. Your directions say 1/8 tsp for 2 quarts. And pecanbread also says to cool to 20° C which is well below 100° F.
It is confusing when you are working with expensive ingredients, time consuming recipe, and are told the bacteria are fragile and easily killed…you want to get the “magic yogurt” right! @ Rebecca – My bottle of GI Pro starter says 1/8th teaspoon per 2 quarts, and I’ve verified this with Pam and Joe over at GI. So I think Pecanbread just has a typo. I just say 100 because its easy for people to remember. I know it can be a bit confusing at first, but it’s worth it in the end! This is also one of the vary reasons Jordan and I adovcate the use of Probiotics right away, because sometimes it can take weeks for people to learn to make SCD yogurt properly. The batch of goat yogurt I made was completely liquid. Is it supposed to be? Any suggestions to make a thicker yogurt? I don’t want to have to drip it…but with this batch there were no solids to drip. When I add the GI Prohealth powder, it clumps in the milk. How do you get it to dissolve when the milk is cooled? Any idea where to get a yogurt thermometer with LARGER easier to read temp settings? The one that came with the Yogourmet is really tiny. I wish someone would make a yogurt maker that is temp controlled for SCD yogurt! Now I need to check the temp and figure out where to set the dimmer. @ Rebecca – Hey, if it was all watery with no solids something defiantly went wrong. I’ve had a few batches turn out like that, I noticed that if I let it ferment past 25hrs it seemed to get more watery. As a general rule, goat’s milk yogurt is thinner than cow’s milk in my experiences. Dripping is actually really easy, I hated the thought of it until I did it once. For the GI Pro starter clumping I just use a balloon whisk and go to town for about 30 seconds after adding it. I just add it right to the bigger container now to save dishes. As far as a different thermometer, you could probably just pick up any candy or baking one to get the job done as long as it reads up to 200 degrees. If you find one you like make sure you post a link her and let us know, because like you there have been a few times when I wished that thing had bigger numbers! I tried to make goat’s milk yogurt a couple months ago and it did not turn out. It just stayed liquid. I also use the Yogourmet maker. I boiled the milk on the stove. I used goat’s milk yogurt as a stater. Maybe that was a problem? I was really disappointed because I wanted to try it and the goat’s milk was really expensive. I have seen many blog posts about the yogourmet temperature. I bought mine from Lucy’s Kitchen Shop ten years ago. She told me when I bough it that Elaine Gottschall said the yogurt from those makers was fine. Not saying people shouldn’t use the dimmer switches. Just passing along some info I got a long time ago. I have been making the yogurt for ten years with no problems. Hey Sherry – I’ve had a few batches of goat’s milk yogurt not work out well, one thing that defiantly seems to create a more watery batch is if you ferment longer than 24-25hrs. Also mine has never worked out when trying other starters. So my guess is that was your problem. For goat’s milk I always use the GI Pro Health starter. For cow’s milk there are lot’s of options that all seem to work great. My Yogourmet has never gotten above 125, but a few occasions I checked it after about 12-14hrs and it was reading that high so I decided to use a dimmer. 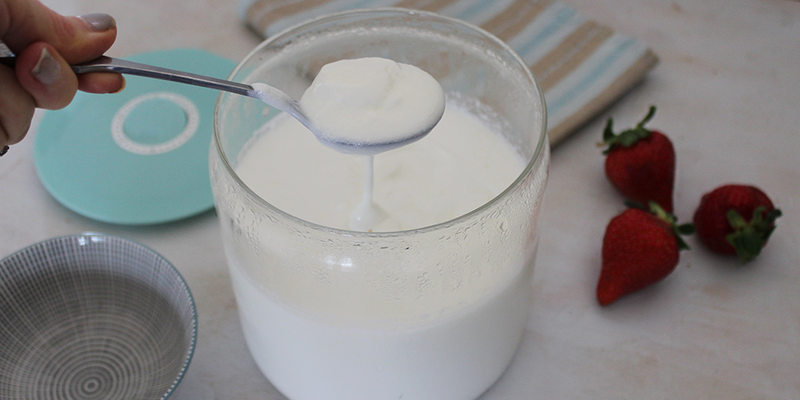 I have a post on my blog showing how I make SCD Yogurt. I use either organic milk or UHT milk! This is an excellent post! It’s great to see how other people make their SCD yogurt! Thanks for posting the link Vicky you created a great resource as well!